During January 2001, a bedrock-hewn winepress to the east of Qibbuz Malkiyya (map ref. NIG 24860/77903; OIG 19860/27903) was examined, prior to paving a bypass road around the Qibbuz. M. Galili, of the Nature and National Parks Authority, notified the Antiquities Authority of its existence. The winepress’ examination, on behalf of the Antiquities Authority and funded by the Jewish National Fund, was conducted by Y. Stepansky, assisted by V. Essman, and V. Pirsky (surveying and drafting). The course of the road was altered to avoid damaging the winepress. The winepress (at least 10 × 15 m; Fig. 1) consisted of a treading surface (1; 2.5 × 4.0 m), two circular collecting vats (2, 3; each 1.5 m in diam.) and a rectangular collecting vat (4; 0.75 × 3.50 m). The latter was joined to the treading surface via three channels. Part of the winepress was covered with soil. Cupmarks and rock-cuttings were discovered around the winepress and in its vicinity. The remains of a wall built of chalk fieldstones were discerned to the north, east and south of the winepress. It was preserved a single course high and it probably separated the winepress from the surrounding area. ﻿1. 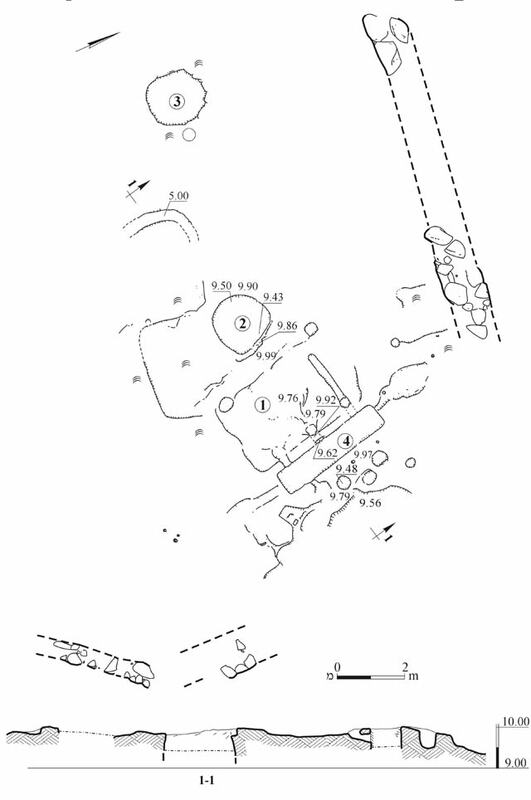 Rock-cut winepress, plan and section.